Have more zucchini than you know what to do with? 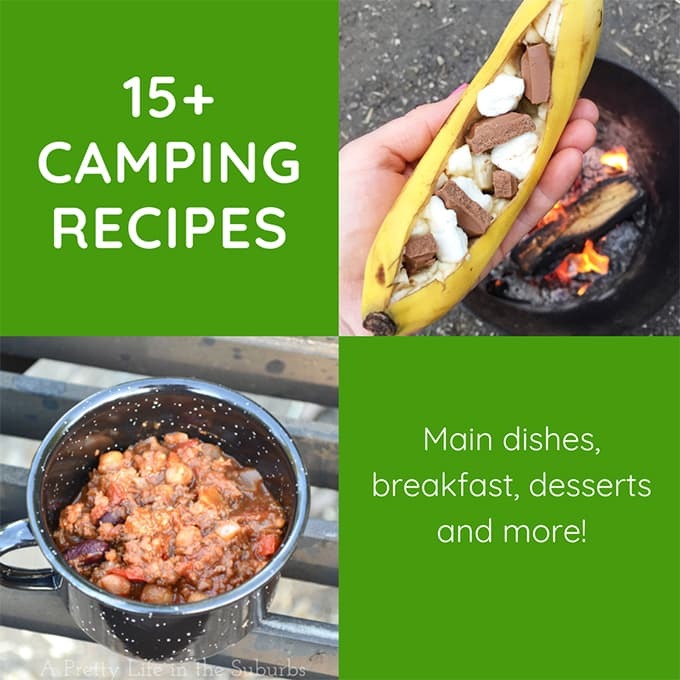 Here are 9+ Delicious Zucchini Recipes To Try! Zucchini is one of the most versatile vegetables available! Zucchini is technically a fruit, but for all intents and purpose it’s treated like a vegetable. No matter, what a zucchini is, is delicious. If you’re one of the lucky ones you have a huge summer crop, with more zucchini than you know what to do with. 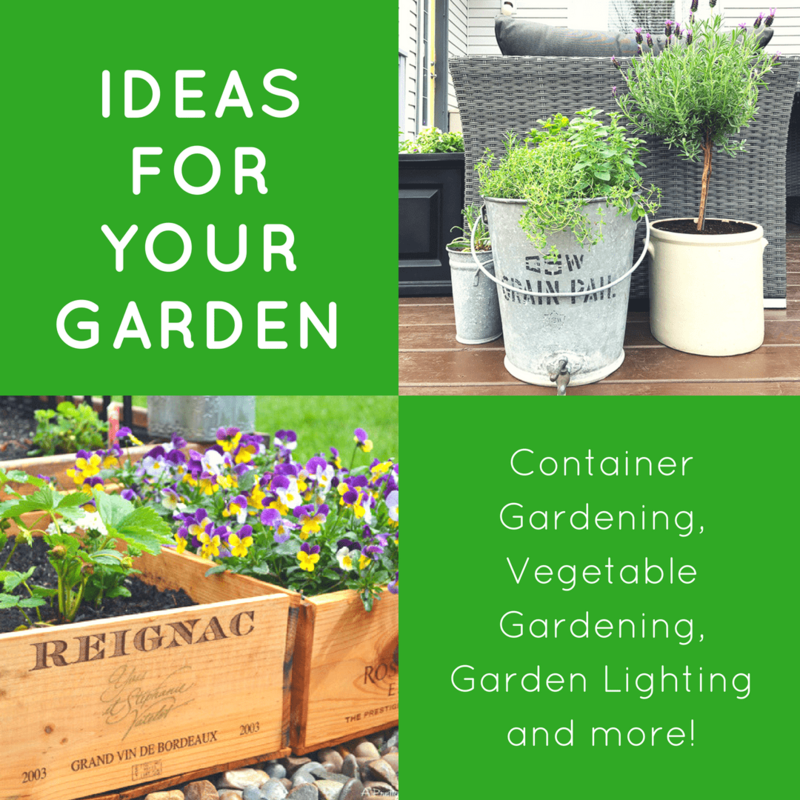 But if you’re like me and you don’t have a personal crop, you can buy plenty of zucchini from your local farmers markets or grocery store, and that is exactly what I do all summer long. All zucchini all the time. Zucchini is great to have on hand because there are so many delicious ways to cook and bake with it without getting bored. 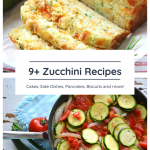 Over the years here on my blog, I’ve shared a few of my favourite zucchini recipes, so I thought I would share them with you again, all in one easy to access place! 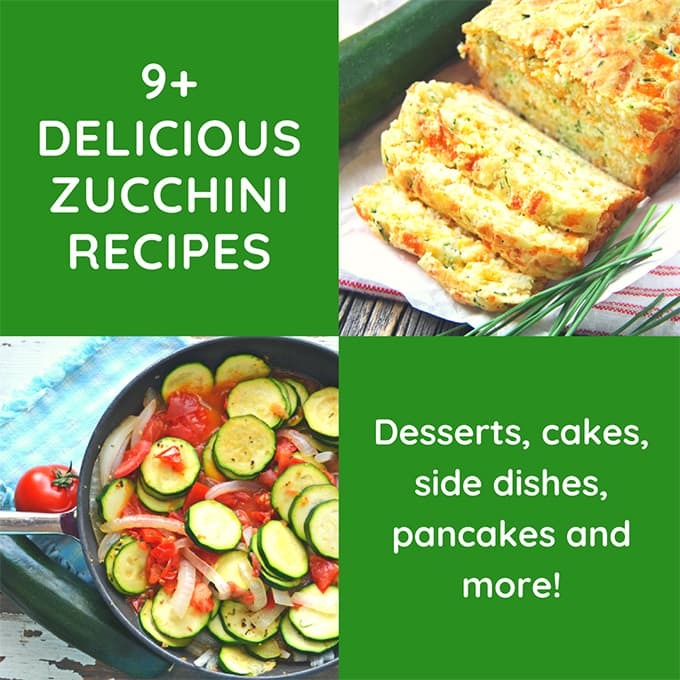 Here are 9+ Delicious Zucchini Recipes To Try! 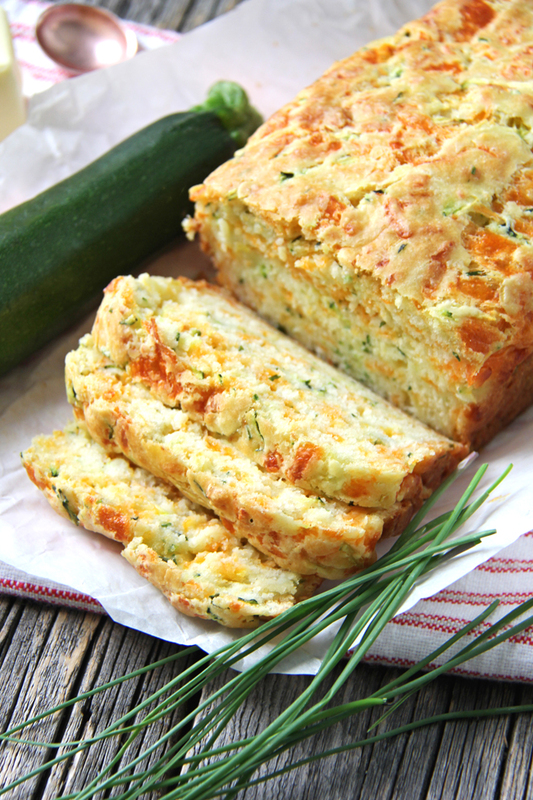 Zucchini, Cheddar Cheese & Chive Buttermilk Quick Bread: Quick bread recipes are fantastic, and this particular recipe is one of my favourites. Aside from the delicious flavour, one of the best things about this bread is that you can have it made, baked and on the table in just over an hour. Fresh bread for dinner? Yes please. 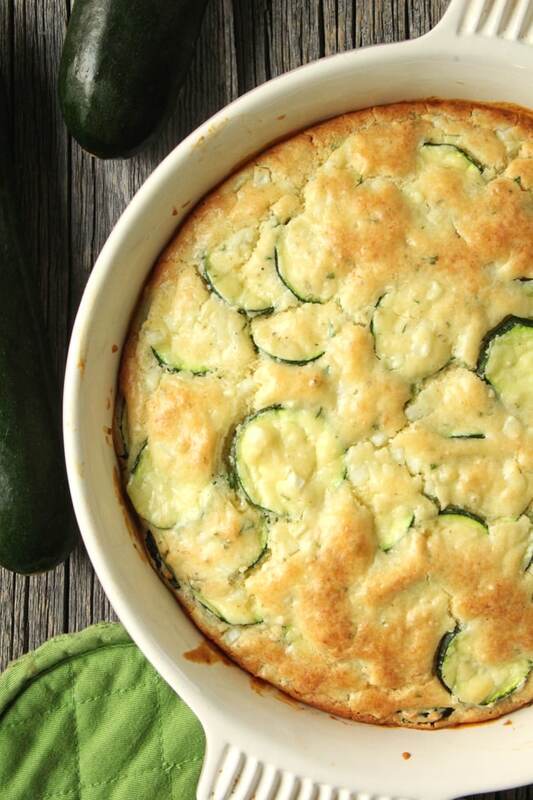 Zucchini Bake: I have been making and enjoying this Zucchini Bake recipe for many, many years because my Mom made it for us when I was a kid, and now I make it for my family. 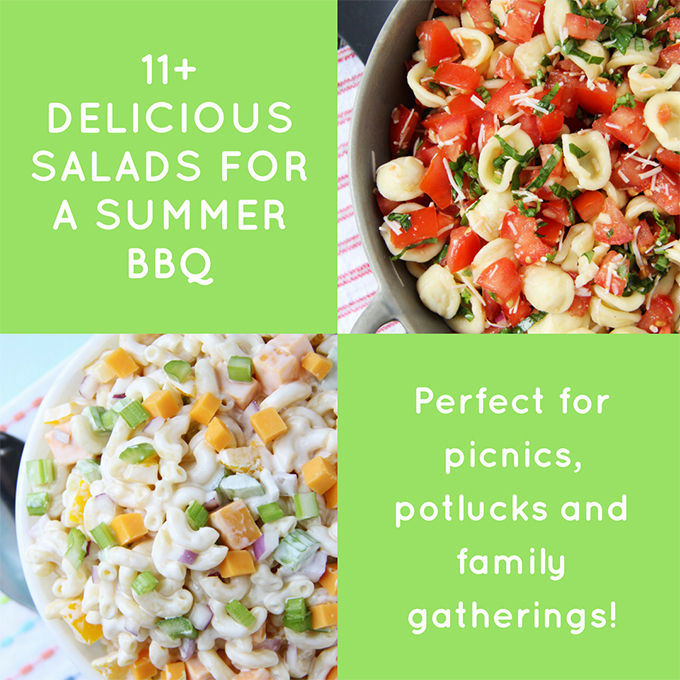 It is a great side dish recipe that pairs well with chicken and BBQ’d meats. 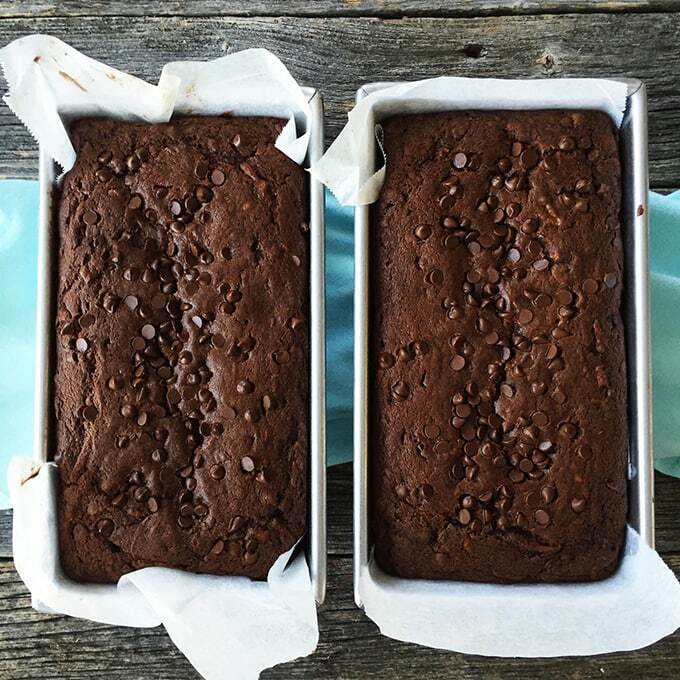 Chocolate Zucchini Cake: You can’t have a zucchini recipe round up without a sweet zucchini loaf or cake! This Chocolate Zucchini Cake is so tender and chocolatey that it would even make a great birthday cake! 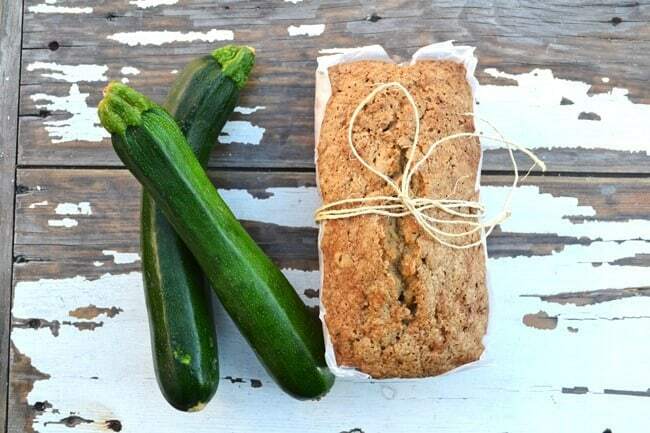 Best Ever Zucchini Bread: I may be biased because this recipe comes from my Mom, but I really do think this is the best ever zucchini bread. I make many, many loaves of this bread over the summer! This is a great recipe because it makes 2 loaves, so you can freeze one for later. Bonus! 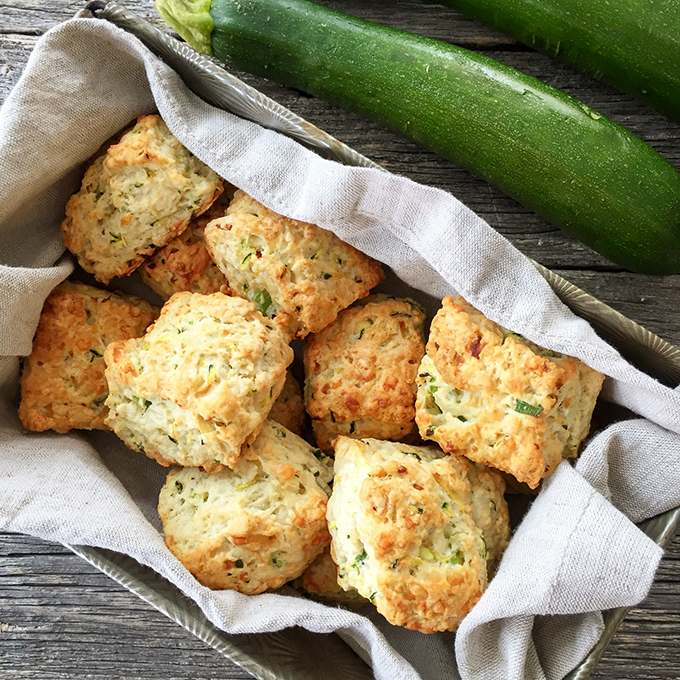 Zucchini Cheddar Biscuits are a perfect biscuit to serve alongside soups and stews! Full of cheesy cheddar flavour! 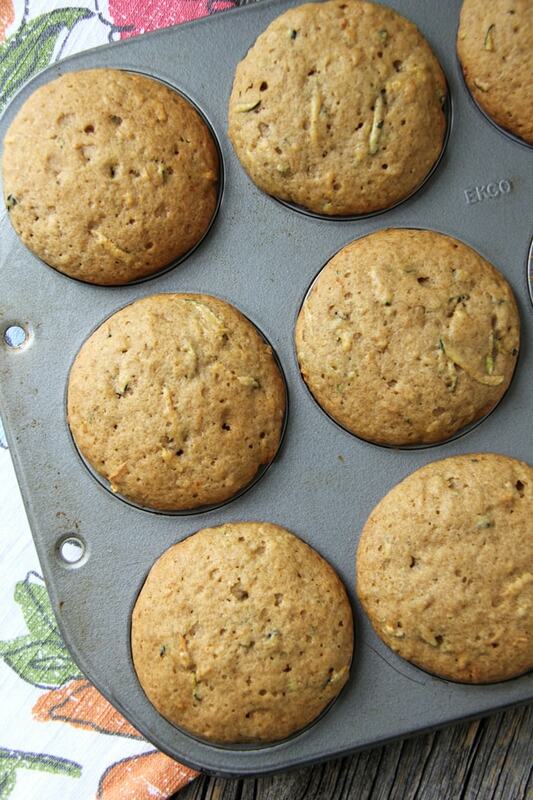 Zucchini Muffins: Zucchini muffins are a nice way to use up zucchini. This is basically the same recipe as my zucchini loaf, but instead I made it into muffins. 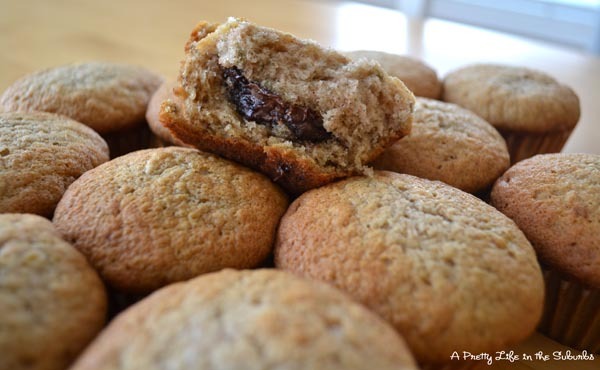 These are great because they are easy to pack into lunches or served as snacks. 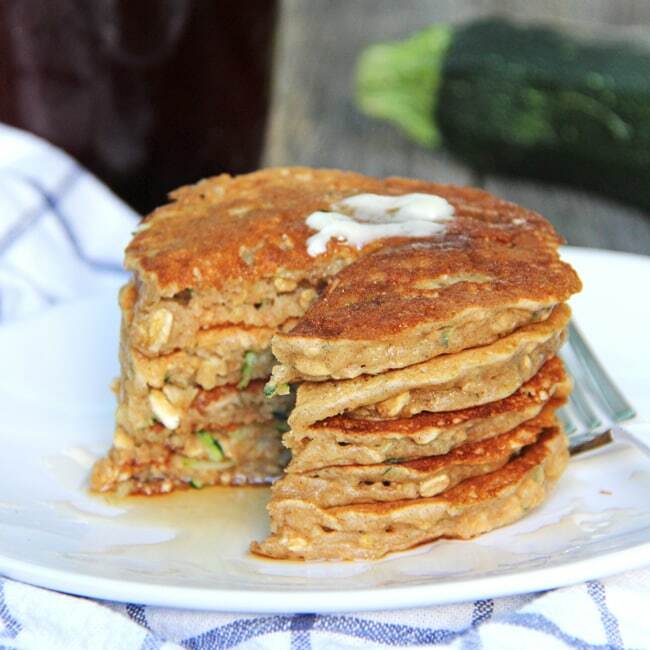 Zucchini Bread Pancakes: Zucchini pancakes are SO delicious. They’re sweet, cinnamon-y and perfect for breakfast. My kids love them. 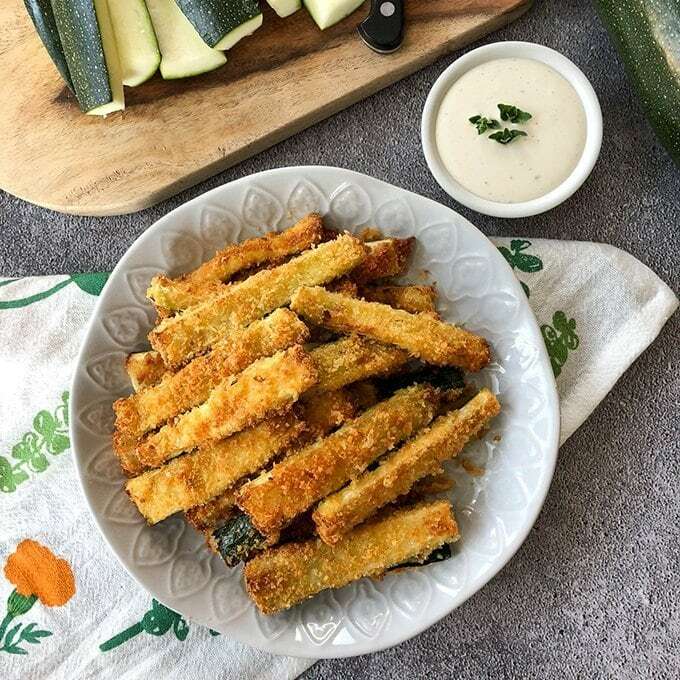 Zucchini Fries made in the Airfryer are so simple and delicious! Made in less than 30 minutes and with just 5 ingredients, they’re perfect for busy weeknight suppers! 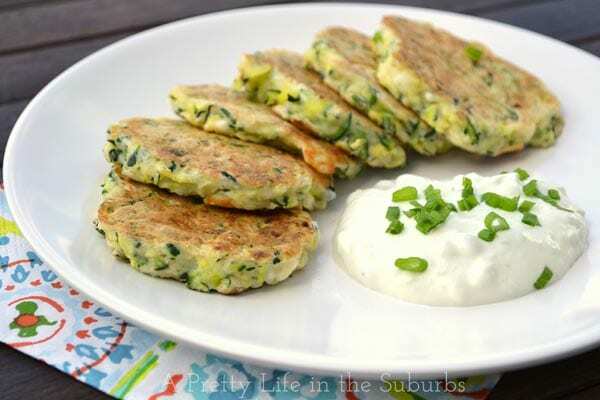 Zucchini Fritters: Zucchini Fritters are a great summer side dish or snack idea. They’re excellent served with Tzatziki sauce for dipping. So good. 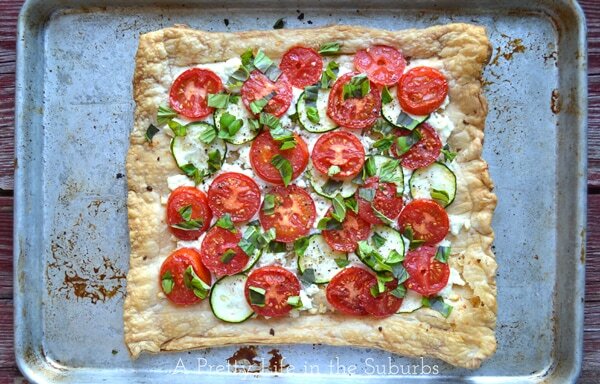 Tomato, Basil & Zucchini Goat Cheese Tart: Tarts are always a big hit around here! 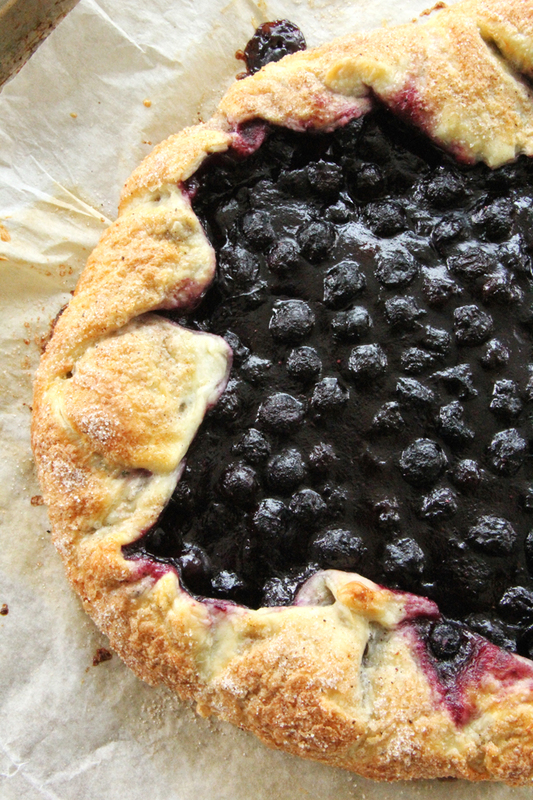 A savoury tart such as this one is a great light dinner idea or summer appetizer. 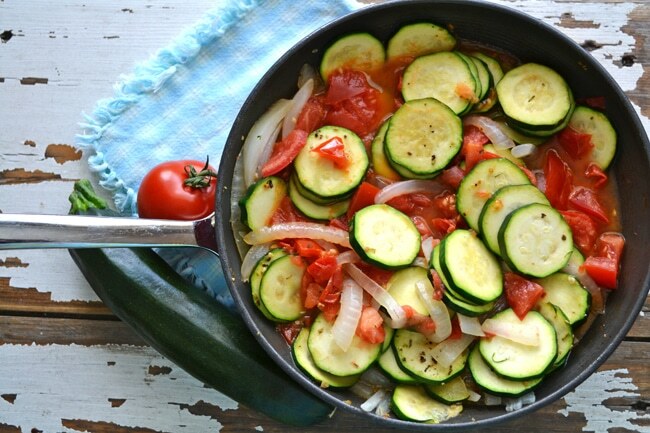 Tomato Zucchini Skillet: I think this skillet just might be my most made dish of all time. During the summer I likely make it once a week because it’s an excellent way to use up a tonne of zucchini, and it pairs wonderfully with any type of BBQ. 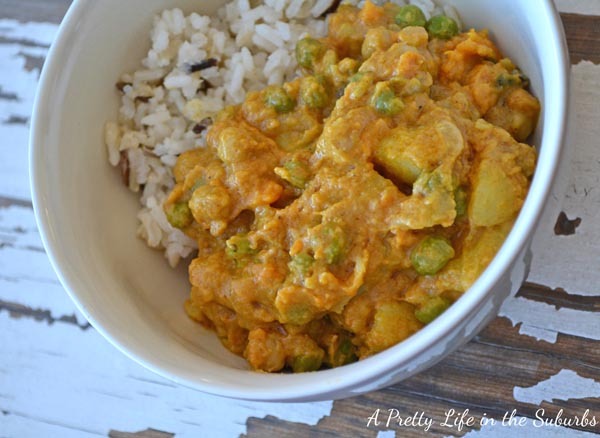 The flavour is great and it’s loaded with vegetable goodness! 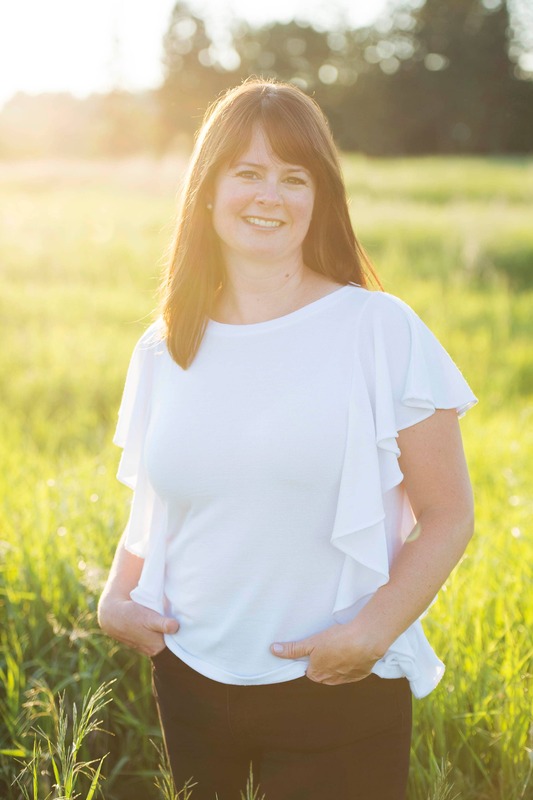 I hope you found some zucchini recipe inspiration for your home! What are your favourite ways to enjoy zucchini?